While not as heated as many political debates, the discussion of whether video games are a positive or negative influence in our children’s lives can quickly elevate to a full blown argument. As we mentioned in our first “Digital Detox” article, we’re not here to harp on or judge varying parenting styles and we can rationalize with both sides of the debate. What we are here to do is provide a vetted resource, chalked full of sources that communicates from both sides of the issue and allows parents to make their own decisions about their children’s time with video games. Does a correlation between gun violence and video games exist? Before we jump into the deliberations let’s setup why this is has been such a hot button issue for the past few decades. At the core of the debate about video games is whether there is a direct connection between video game consumption and gun-related killings. A mournful discussion usually arises after horrific school shootings, such as Columbine, Virginia Tech, and Sandy Hook. Moreover, video games are also often thought of as the catalyst to increases in bullying and violence towards women. The search for meaning is a natural response to any tragedy—but what role, if any, do violent video games actually play? A Harvard study conducted in 2008 entitled, Grand Theft Childhood reported that 60% of middle school boys who played at least one mature-rated (M-rated) video game have hit or beat up someone, compared to 39% that haven’t played M-rated games. This is believed to occur because violent games routinely reward players for simulating violence and associating pleasure with the ability to cause pain. This enhances the learning of violent behaviors—in effect desensitizing players to real-life violence. In addition to causing violence, excessive video game playing has been linked to obesity, irregular sleep, and impaired academic performance. Here in the United States, we have the highest firearm murder rate in the world—by far—with about nine guns for every 10 Americans. However, other countries where video games are even more popular than in America have much lower firearm-related deaths. In fact, countries like the Netherlands and South Korea where they spend the most money on games each year have the fewest gun-related murders in the world. If there were a correlation between games and violence, then we would expect to see an upward trend—meaning the more money spent on games, the more violence in the country. The minimal correlations that have been found between video games and gun violence may be clarified by violent youth being drawn to violent video games. Violent games do not cause youth to be violent—instead, kids that are inclined to be violent seek out violent entertainment. There is a general societal tendency to be skeptical of new media. Plato, in The Republic, argued that poetry should be banned due to its harmful effect on the young. When writing became technically easier and was harnessed by the young, elders warned that this would be a problem since they were not longer forced to exercise their memories. The fear has extended from printed novels and television to now the Internet and video games, within the last twenty years. While we’ve presented both sides of the coin here, we believe there is one aspect that both sides can agree upon—video games, or any media outlet, in excess can have negative effects on the social and emotional development of children. Here are some tips for parents to not only keep their kids from going overboard on the screen time, but also develop healthy habits with computers, TV, and videogames. Know your ratings: The ESRB issues rating for every commercial video game produced. They range from eC (for Early Childhood) to T (teen) and even up to M (Mature) and A/O (adults only). Mature games are very common, especially for first-person shooters (think: Halo, Call of Duty, and Counterstrike), and can’t be purchased by anyone under the age of 17. Set the example: Be a good role model by limiting your own screen time. Too hard? You may want to try to designate one day a week as a screen-free day. 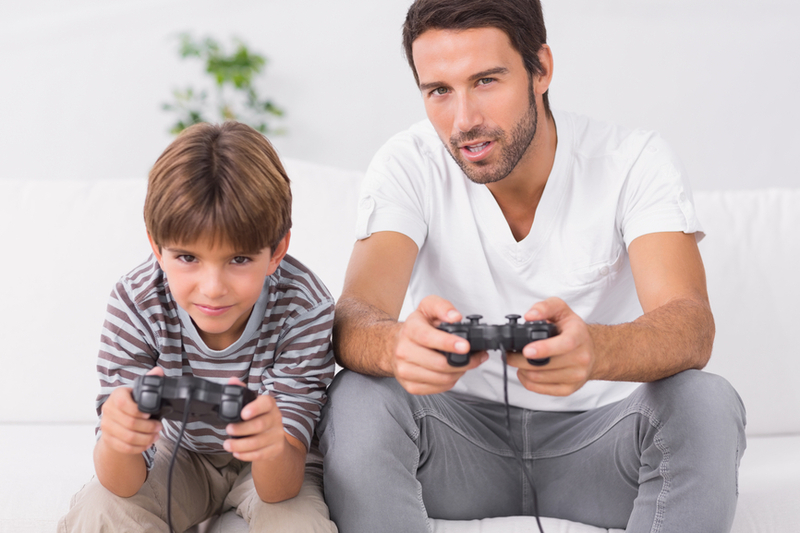 Play games/watch shows with your children: Not only will you be growing closer with your kid but you can also take this opportunity to discuss violence or questionable elements in the game. Share your feelings and strike up a friendly debate with other parents about certain games, shows or movies.